The 2018 calendar has concentrated some jazzy holiday celebrations. While events in honor of Valentine’s Day start this weekend – check out our Valentine’s Jazz 2018 article to learn more – gigs celebrating Mardi Gras, Tuesday February 13th, are also on their way! 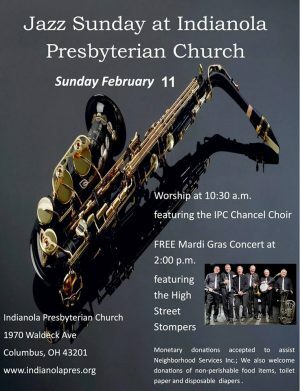 Kicking off our Mardi Gras Jazz Guide is the annual Mardi Gras Dixieland Jazz Concert at Indianola Presbyterian Church (OSU campus) on Sunday, February 11th at 2pm – Check out all-star Dixieland band The High Street Stompers for free (donations encouraged, benefiting the area foodbank)! Another festive annual event takes place on Monday, February 12th at 7:30pm when Vaughn Wiester’s Famous Jazz Orchestra presents “Carnaval in Rio” at the Clintonville Woman’s Club. This year’s concert features vocalists Natalie Adams and Rachel Sepulveda, plus a program of swinging Brazilian and Latin American tunes. Admission is $10 for adults and $5 for students. Keep reading for details on the schedule for Fat Tuesday plus more area live jazz previews. Mardi Gras, Tuesday, February 13th: Creole Kitchen (King-Lincoln Bronzeville) will be partying all day with a crawfish boil starting at 11am, but join the Route 161 Happy Wanderers for Louisiana, New Orleans and Brazilian classics starting at 5pm. The mighty New Basics Brass Band kicks off their annual holiday doubleheader with the Fat Tuesday dinner at Gallo’s Kitchen (Upper Arlington) at 6pm – call (614) 754-8176 ASAP for reservations for this popular event. Also at 6pm is the Jazz Arts Group Mardi Gras Celebration at the Westin Hotel Downtown, where a quartet of Colin Lazarski (guitar and banjo), Kris Keith (woodwinds), Dave DeWitt (bass), and Louis Tsamous (drums) will entertain next to a festive $25/plate spread – Call Caitlin Neary at (614) 220-7025 by Friday to RSVP. The Light of Seven Matchsticks, the speakeasy located in the lower level of Natalie’s, will feature Dave Powers starting at 7pm for their own joyous soiree – more details here. Finally, New Basics comes back for round two with the kickoff of their Fat Tuesdays series of monthly shows at Rambling House at 9pm – more details here for this always lively New Orleans style party. Of course, Tuesday’s regular weekly and monthly events will also surely be in the spirit, so check the Columbus Jazz Calendar and catch some jazz where you can! Laissez les bons temps rouler! Friday, February 9th (7 – 9pm): Central Ohio Hot Jazz Society (COHJS) Presents Dave Kosmyna’s Original Downhome Jazz Band at Park Street Tavern. Before COHJS gets their spring season of hot jazz concerts underway next month, they are presenting a special FREE show “To thank and entertain all the hard-working music educators in Ohio, just a block from the OMEA (Ohio Music Education Association) Conference.” A heavy-hitting lineup of Dave Kosmyna on cornet, Ray Heitger on clarinet and vocals, Chris Smith on trombone, James Dapogny on piano, and Pete Siers on drums have come together “to celebrate the 1917 recording by the Original Dixieland Jass Band that’s widely recognized as the first jazz recording.” Enjoy a swinging early show to kickoff your weekend in style! Saturday, February 10th (3 – 5pm): Second Saturdays: Sonikora & Stems at Filament at The Vanderelli Room. Improvisational trio Sonikora is back at the helm of their monthly collaborative showcase in the cozy new confines of Filament. Along with a set by Sonikora, young outfit Stems will share their live band brand of hip-hop, with elements of rock styles and more. The two bands will also combine at some point to create some new music on the spot! Admission is $5 to $10 on a sliding scale for an afternoon of sonic exploration.